A post-apocalyptic tale of a classic Marvel hero ... sort of. Since it began, I've semi-seriously claimed that Walter Simonson's Ragnarok is a covert Secret Wars tie-in. Simply edit this book's Thor into some of the crowd scenes in Secret Wars and Thors and the illusion would be complete. It has the feel of other tie-ins like Old Man Logan and Future Imperfect, which were set in versions of the Marvel Universe gone wrong. On the other hand, Simonson has the ability to go off in his own direction after Ragnarok Vol. 1: Last God Standing by maintaining the book's own continuity. There's a strong sense that Simonson has intended Ragnarok to be his magnum opus. The ties to his Mighty Thor are obvious, but there are also elements of his Orion run with the presence of teleportation gates, while an antagonist bears quite a resemblance to the titular character of the Elric comics he worked on. At some point I expect the Star Slammers and Manhunter to show up. 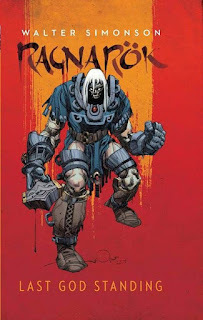 Simonson has joked on his Facebook page that he wasn't sure if he "still had it" when it came to creating comics; Ragnarok is the powerful rejection of this fear. One slight difference between Thor and Ragnarok is a greater use of Norse mythology. Simonson was one of the first writers to incorporate accurate Norse myths into Marvel's version of Asgard, from the increased use of Thor's flying goat chariot to the appearance of Naglfar, the ship made out of the toenails of the dead. In Ragnarok, Simonson goes deeper into the well to incorporate such mythical creatures as Ratatosk, the squirrel who passes messages up and down Yggdrasil. While the great squirrel did appear in Thor and the Warriors Four to menace the Power Pack, this is one of the rare times that the concept has been taken seriously. In fact, "serious" is one of the main themes of Ragnarok: despite the title, the world has already ended and the gods are already dead. The first issue is a bit of a fake-out as we follow a family of Dark Elf assassins tasked with destroying any remaining gods. They are only the protagonists briefly before switching to a mix of allies and enemies when the undead Thor returns to take center stage. Along with the more complex suit of armor, one of this Thor's biggest design changes is the lack of a lower jaw. This doesn't interfere with his ability to speak, or with his ability to eat the apples of Idunn that maintain his existence (in a nice moment of levity, even he can't explain how that works). Thor does his best to uphold his noble nature, but his state of undeath and the fate of Asgard clearly weigh heavily upon him. There are also some familiar faces for fans of Simonson's Mighty Thor. As in his original run, Surtur (spelled Surtr here) is gearing up to be the key villain. In a flashback to the events of the actual Ragnarok, a glimpse of Jormungandr confirms that Simonson used the Marvel design of the Midgard Serpent. The ever-present Mjolnir is closer to its axe-like, tribal roots, but it's still able to conjure storms and portals like the Marvel version. Conversely, one of the new major elements are the Draugr, undead warriors who predate modern zombie lore by centuries. Their appearance made me wonder if Simonson made them up, but Norse mythology is so bizarre on its own that it keeps delivering surprises every time it's mined for story concepts. For Ragnarok, Simonson decided to team up with colorist and frequent John Cassaday collaborator Laura Martin. This was a great move; I wasn't a fan of the color work on The Judas Coin or the remastered Mighty Thor by Walter Simonson trades, but Martin gets Simonson's art style. As a bonus, the series has a looser schedule than it would have at Marvel, and Martin has the time to really get into the details much in the way she does with Cassaday. As always, John Workman is on hand to provide his fantastic sound effects and lettering. I'm still impressed by how well Simonson and Workman collaborate to keep enough room available for the sound effects. Even with the mythological roots of Ragnarok Vol. 1: Last God Standing, I'm very curious to see where this story will end up. From the perspective of this story, all of the major myths are already over, and Thor is walking through the ruins in an attempt to salvage what he can. So while the original Mighty Thor run had a pre-set path, Simonson can really go anywhere he wants. Plus, while Odin puts in a post-mortem appearance, Loki is suspiciously absent, and I doubt that such a powerful trickster is going to be left out. I can't say with certainty that this is Walter Simonson's last great work, but it's shaping up to be a fitting coda to his greatest work.